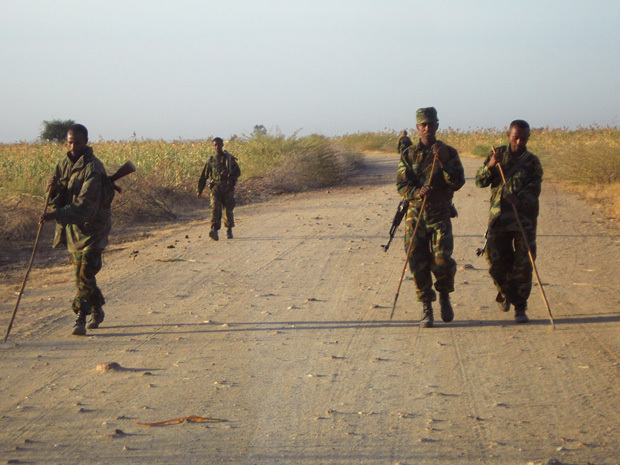 Ethiopian troops check for mines near the town of Badme on the Ethiopian-Eritrean border. For several years, combat along the tense Eritrean-Ethiopian frontier has been entirely rhetorical. This changed on March 16th, 2012 when the Ethiopian government boldly announced that it had crossed into Eritrean territory in an attack on three military installations. Citing Asmara’s role in the January death and abduction of European tourists in Ethiopia’s Afar region, Ethiopia’s retaliation represented the first direct military confrontation between Eritrea and Ethiopia since the 1998-2000 border war. Coincidentally, these events came one month before the 10th anniversary of the delimitation decision of the Eritrean Ethiopian Boundary Commission. The EEBC was the product of the Algiers Accord, which formally ended the Eritrean-Ethiopian war by referring the border dispute to arbitration. The EEBC’s findings should have been the final chapter in the bloody border row between the two countries, but instead, gave the dispute new momentum. The crux of the problem was that Ethiopia rejected the EEBC’s decision when it realized that Badme, the small piece of disputed territory that triggered the border war, and which it had acquired at a high human cost, had been awarded to Eritrea. Addis later accepted the decision “in principle,” but demanded negotiations on the normalization of relations before it would permit the disputed border to be demarcated (and return Badme to Eritrea). Eritrea responded by invoking the language of the Algiers accord, asserting that the because EEBC decision was designed to be “final and binding,” attempts to link its implementation to the normalization of relations were, ipso facto, a violation of existing agreements between the two parties. Only after the border was demarcated and Badme returned, could dialogue on normalization be held. While the Eritrean position should not be viewed uncritically, from an international legal perspective, the Red Sea state had the facts on its side. After all, both Eritrea and Ethiopia signed on the dotted line. Over the course of the next decade, this stalemate engendered openly hostile security competition between Asmara and Addis, which often played out in venues far from the Eritrean-Ethiopian frontier”” Sudan, Somalia, and the UN Security Council. The domestic effects of the dispute have not been minor either, as Eritrea’s youth remains indefinitely mobilized for war, at a huge cost to their individual liberty and the country’s overall economy. So what explains Ethiopia’s refusal to implement the EEBC decision? The oft cited personal enmity between the conflict’s two primary protagonists, Ethiopian Prime Minister Meles Zenawi and Eritrean President Issias Afeworki, is only part of the story. As is the reality that Ethiopia incurs few costs for its recalcitrance, since it retains significant military and diplomatic advantages over Eritrea. Instead, a more complete portrait of Addis Ababa’s calculations would acknowledge three basic points. First, the government of Meles Zenawi refuses to implement the EEBC decision because it has no reasonable guarantee that such action will alter the aggressive, adversarial strategic posture of Eritrea. Second, the Meles regime believes that if it permitted border demarcation and the return of Badme, only to face the continuation of the onerous security rivalry with Asmara, it would pay high domestic costs. Third, the genesis of these two beliefs can only be understood through a careful consideration of the origins of the Eritrean-Ethiopian border war. Although Prime Minister Meles Zenawi warmly embraced Eritrean independence in 1993, this position was not cheap. Never a dominant force within TPLF party structures, Meles faced substantial criticism from internal party rivals, in addition to a large segment of Ethiopia’s non-TPLF political class, for the manner in which his government partitioned the country. There were several objections, and the list seemed to grow longer as time wore on. The decision to formally grant Eritrean independence involved little public consultation (at least on the Ethiopian side), and the Eritrean referendum on independence was widely panned as biased in favor secession. Nor was Ethiopia’s access to the sea the guaranteed, an issue that many believed imperiled the nation’s economic security, and was of major emotional and symbolic significance to the Ethiopian public. Adding fuel to the fire was the reality that Eritreans continued to occupy a visible role in Ethiopia’s economy, creating the impression that the Eritreans had acquired the benefits of secession, but paid none of the costs. Whatever the merits of these criticisms, Meles was not in a good position to refute them. Having cultivated close personal relations with the leadership of Eritrea’s rebel group turned ruling party, the EPLF, and having relied on their support in winning political power, Meles found it hard to dispel the impression that he was an Eritrean lackey. Reinforcing these perceptions was the uncomfortable fact that Meles is himself half-Eritrean. So what did this all mean? The bottom line is that by the mid -1990’s, the political career of PM Meles, and those affiliated with his faction within the TPLF, hinged on making the relationship with Eritrea “work.” The Meles faction expended large amounts of political capital in accepting Eritrean independence on unfavorable terms, and if the relationship went sour, they would be left holding the bag. Events leading up to the surprise outbreak of war in May 1998 should be understood in this context. When difficult partition related issues began to surface between Asmara and Addis, the most important of which were related to trade and borders, Meles faced a difficult task: he had to placate the critics in his own party, who demanded a harder line on Eritrea, while preserving the amicable bi-lateral relationship on which his political reputation depended. As events would soon demonstrate, this was a tension that the Meles faction could not resolve. Throughout 1997 and early 1998, the Prime Minister’s rivals stoked tensions along the Eritrean-Ethiopian border. Gebru Asrat, who would later lead the charge against Meles within the TPLF, served as Governor of the Ethiopian border province of Tigray, the ideal perch from which to gin up war. It was here that things took a turn for the worse. While Asmara was no doubt aware of the pressure Meles faced, this recognition did not appear to inform their strategy. Instead of demonstrating restraint, and working with the Prime Minister to marginalize hardliners within his party, it did just the opposite. The killing of several Eritrean officers in the vicinity of Badme served as the final provocation, as Asmara responded with overwhelming force, seizing all of the disputed territories and dismantling their local Ethiopian administrations. The Eritrean gambit was nothing new. In 1995, Asmara pursued a similarly muscular strategy in its dispute with Yemen over the Hanish Islands: deploy overwhelming force to assert control over contested land, and enter into negotiations from a position of strength. Yet to Meles and his allies, this was a critical betrayal by a neighboring government for whom they had sacrificed so much. In Addis, the Eritrean maneuver incited a power struggle within the TPLF that would place Meles’ political career on life support. The Prime Minister was excoriated for having coddled the Eritreans, and for failing to make proper military preparations for the defense of Ethiopia’s territorial integrity. As his rivals within the ruling party publicly sounded the alarm for war, Meles privately attempted to put the brake on their efforts, in the hope that peace with Eritrea could be salvaged, and his pro-Eritrea foreign policy validated. Yet again, Asmara did Meles no favors. Initially surprised by the shrill rhetoric emanating from the Ethiopian capital, President Isaias stood fast, refusing to relinquish control over territories he believed to be both Eritrean, and militarily defensible. Now sitting between a rock and a hard place, Meles grudgingly accepted the demand for war. Still, the PM’s rivals remained unappeased, labeling him “a reluctant warrior.” The Eritrea issue now became a virtual albatross around the neck of the Meles faction. The split within the TPLF produced by events at Badme would play out over the next few years, and become more acute as events on the battlefield began to shift in Ethiopia’s favor. In March 2001, the internal struggle would end decisively in victory for the Meles Zenawi faction. Yet the Prime Minister came perilously close to losing power, and it was easy to understand why he would hold Asmara responsible. Having supported Eritrea in the partition process, and paid dearly for it, the Meles faction expected Asmara to return the favor by demonstrating to their internal opponents that the relationship between the two countries could be amicable and mutually beneficial. Instead, Asmara’s aggressive behavior at Badme betrayed the Meles faction’s trust, and rendered them vulnerable within their own party. The current impasse over the EEBC decision is informed by this history. While Meles is not as vulnerable to internal challenge as he once was, he faces an eerily familiar situation. Without a quid pro quo, demarcating the border is analogous to the no-strings-attached independence of Eritrea. Like the highly unfavorable terms of Eritrean independence, returning Badme to Eritrea will be domestically unpopular, and evoke similar claims about Meles’ pro-Eritrean disposition. And like the fiasco at Badme, a flare-up between Asmara and Addis subsequent to the implementation of the EEBC decision would leave Meles facing a profound domestic crisis of confidence. What this all means for the international community’s approach to the Eritrean-Ethiopian border dispute is uncertain. Yet concerned parties would do well to understand what makes the conflict’s protagonists tick. Ethiopian equivocation over a “final and binding” delimitation decision – a key hurdle in the resolution of the Eritrean-Ethiopian border dispute – is dictated by perceptions of risk firmly rooted in the complex origins of the Eritrean-Ethiopian war. This doesn’t exonerate the Meles government, but it does place its behavior in more intelligible terms. Mike Woldemariam is assistant professor at Boston University’s department of international relations. This is a well-written article but I have a few issues with your article. I do not claim to know much about TPLF and Meles’ dominance prior to TPLF’s takeover of Ethiopia. But it seems a little naive to say that TPLF “warmly embraced” Eritrea’s independence in 1993 because of TPLF’s Manifesto in 1976 of “Republic of Greater Tigray” (http://www.abbaymedia.com/TPLF_1976_Manifesto.htm). It is clear that TPLF had their own agenda even while they were fighting along with EPLF during the civil war. So it is not a â€œsurpriseâ€ to see the border conflict flaring up in 1998 (nor was it an â€œoutbreakâ€) only 5 years after Eritrea gained its independence. It is also important to note the escalation to war did not happen within a short span of time. Small border incursions made by Ethiopian forces were continuously happening for a few years prior to the declaration of war. And there were many repeated attempts to quell these minor, yet serious, incursions by the Eritrean government prior to the major escalation to war. Lastly, it was TPLF that made the declaration of war even though the Eritrean government was still willing to have dialogue and resolve these issues. To my knowledge, whenever there is a vote for secession, it has always been the group that is requesting to secede that votes on their independence. Outside groups do not have a reason nor a right to vote. So of course the Ethiopian publicâ€™s consultation was not involved. Clearly, the Eritrean referendum on independence was going to be widely panned as biased in favor of secession because Eritreans were finally controlling their own fate after 30 long years of civil war and MANY violations of war on civilians along with being initially shut out of deciding its (Eritreaâ€™s) own fate in the 1940-1950â€™s by the UN due to interests of the west (i.e American John Foster Dulles in 1952 – â€œFrom the point of view of justice, the opinions of the Eritrean people must receive consideration. Nevertheless, the strategic interests of the United States in the Red Sea Basin and considerations of security and world peace make it necessary that the country [Eritrea] be linked with our ally, Ethiopia.â€). Whether or not Melesâ€™ popularity was favorable or not within TPLF has nothing to do with Eritrea and its government. I find it to be a little presumptuous to say â€œAsmara was no doubt aware of the pressure Meles facedâ€. If he was unpopular solely due to Eritreaâ€™s independence and all the ramifications because of it (no longer having access to sea etc), TPLF members were only exposing their true sentiments and never gave up on their plans of their 1976 Manifesto completely disregarding and disrespecting Eritreaâ€™s independence. Instead of deciding to work together and figuring out ways for the new Ethiopia to co-exist and develop with Eritrea and its ports, why decide to pick on Eritrea and then declare war? I find it hard to believe that Meles â€œprivately attempted to put the brake on their efforts, in the hope that peace with Eritrea could be salvagedâ€ and I have never read nor heard an interview by Meles stating such assumptions. Lastly, I believe this impasse on the border conflict has to do more so with western interests and influences than any other issues you stated in your article. This is LOUD and CLEAR by the international communitiesâ€™ silence on Ethiopiaâ€™s 10 year long illegal occupation of Eritrean sovereign land, their refusal to implement the final and binding Eritrean-Ethiopian boundary demarcation decision and the recent attack on the three military installations in Eritrea. The UN, the AU, the EU etc are all COMPLETELY silent on this injustice that is clear as day and unapologetically admitted by the Ethiopian government repeatedly YET the UN imposed sanctions on Eritrea based on UNSUBSTANTIATED allegations from Ethiopia? Very well written food for thought. The author does not have a grasp of the reality on the ground here in the Horn of Africa, not suprising for a USA based academic writing on Africa. To start with, there have been repeated incursions by Ethiopia across the Eritrean border for over a decade now, ranging from a few hundred troops to several thousand. Ethiopia has occupied strategic Eritrean territory along the border since the peace deal over a decade ago. If the author did their homework, starting with watching the satellite news from our region they would have seen the reports that over a hundred Ethiopian troops were killed on Eritrean territory in Dec. 2009, for example. Claims that Eritrea is involved with terrorism and kidnappings in Ethiopia have been exposed as fabrications by the Wikileaks series on Ethiopia. As for Meles Zenawi and his claims to power the author apparently missed the BBC program on how he stole so much of the funds sent for the Ethiopian famine victims way back in the early 1980’s, demonstrating Meles control of the TPLF back then. There is a lot more faulty information and the general lack of homework by the author on our region is rather sad for a ph.d, even a newly minted one. But then one gets used to such lack of research from USA based academics. I would be back to you soon with additional stuff to your herein above appearing essay. The ruling class in Ethiopia were “Made in Eritrea” and with this in mind all that I read was poorly researched and is primarily prepared for Western readers. Eritrea and specially the EPLF hand-fed the TPLF from infancy to manhood. Do not over impose them, as we are too well aware of their capability, way of thinking and ultimate deep-heart felt desires. Their rag-tag parliament and rubber stamping inner circle mentality is thoroughly understood here in Asmara. They can never outsmart us when it comes to securing our national integrity, no matter who is hatching their agenda. The fact remains when it comes to Ethiopia and the HOA, Eritrea holds the key to unity, stability and road map to prosperity. what diplomatic negotiation tactics can be used to solve this misunderstanding between these two beautiful countries in Africa.